The Gospel records are extraordinary for their accounts of the encounters and conversations Jesus had with women of all kinds. But this wasn't sexual attraction - these women grew to love Him because He treated them with dignity and compassion. In an age where women were considered second-class citizens, Jesus devoted time and care to them all - the godly, the grieving, the sick, the stressed, the sinful outcasts and even the foreign 'dogs'. But in all his dealings with women, Jesus wanted to give them the opportunity to hear and receive His good news - that however we live, we all need God's forgiveness; that whatever we have done, we can be forgiven by God, through Jesus. Women didn't only experience a welcome from Jesus; they received a brand new life of hope, joy and peace, as forgiven children of God. Worldwide the good news of Jesus still transforms the lives of countless women today. By using this Good Book Guide to examine the encounters of these eight women who met Jesus, you too can learn about His liberating good news, discover what it means to have true faith, and experience His transforming power in your life. Follows on from the bestselling Good Book Guide study 'Women of Faith' - 8 women of the Old Testament. 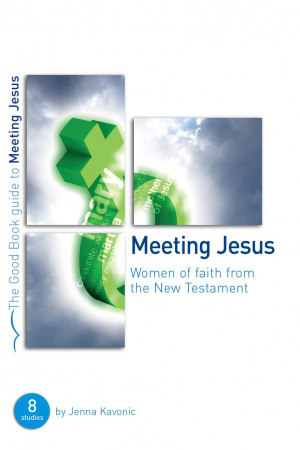 Meeting Jesus : 8 Women of the New Testament by Jenna Kavonic was published by Good Book Company in October 2006 and is our 6529th best seller. The ISBN for Meeting Jesus : 8 Women of the New Testament is 9781905564460. Be the first to review Meeting Jesus : 8 Women of the New Testament! Got a question? No problem! Just click here to ask us about Meeting Jesus : 8 Women of the New Testament.